The 100% Iberian pigs are those whose progenitors are also pure Iberian pigs, that is to say, they have not been crossed with any other breed of pig than Iberian. 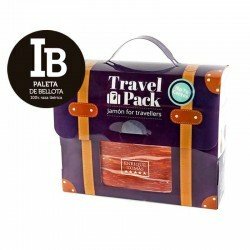 The meat, whether it is the Paleta 100% Ibérica Bellota "Pata negra" or the Jamón of the same type, is tastier than that of a crossbred pig because the infiltration of fat into the muscle of the animal from which they come is superior. This infiltration of fat is a genetic peculiarity that only Iberian pigs have and that makes them have such a delicious meat. Depending on whether they feed on acorn or not, and the curing process that follows, the aroma and nuances of their meat will be one or the other. In Enrique Tomás, as Jamón’s experts, we know that every Paleta (ham shoulder)100% Iberica Bellota (acorn-fed), also known as the "pata negra", must be dry curing for 24 months to ensure that its flavor is at the optimum point. As soon as you want to enjoy such an exquisite product, we have it available in all formats, both whole and sliced. If you want to give yourself a treat you can buy one of our 80 gram packs, sliced both by machine and knife, but if on the contrary you want to enjoy this wonderful gastronomic experience with friends or family, you can buy a whole leg and cut it yourself. You're gonna fall for their flavor! All the Iberian pigs suckle from the mother and eat feed up to 100 kilograms when some will make the Montanera (period where they roam and eat in freedom) and others not. The pigs that are brought to the pasture will be fed for five months, from October to February, with acorns and other natural products and will be constantly exercising. When the Iberian pigs reach 150 kilograms, they will be ready for the dry-curing process. Its infiltration of fat into the muscle, together with the diet based on acorns and the exercise they do, is a perfect combination that gives rise to a very tasty meat full of aromas and nuances, dry-cured for 24 months, the exact time for its flavor to be the best. At Enrique Tomás we take much care of each of our ham shoulders with attention to detail, so we make sure they are just right at their point. Why they are called Pata Negra ham shoulder-Paleta? A particular physical characteristic of Iberian pigs is that they have longer and more stylised legs than pigs of other breeds and with generally black hooves, although this does not always have to be the case. The Pata Negra Paleta is popularly known by this name for this peculiar feature.